The refusal of Muslims and non-Muslims to read each other’s scriptures is frequently based on deep-seated prejudices and feelings of political enmity. In some cases, people even believe they are forbidden to read the scriptures of the other. They may refuse to read the scripture of the other out of fear.How can we reason together if we refuse to read? Prohibitions against reading make reasoning impossible, and we are left with only second-hand impressions of the scriptures rather than a useful knowledge of the contents of the scriptures themselves.One Muslim scholar who faced a prohibitions against reading the Bible, pushed back with a strong argument that reading the Bible is fully in line with Islamic tradition. Al-Biqa-i (d. 1480 AD) faced criticism from other scholars in Cairo in the fifteenth century for including material from the Bible in his great commentary on the Qur’an, Naxm al-durar fi tanasub al-ayat wa l-suwar )”String of pearls concerning the harmony of verses and suras”). Al-Biqa I argued that permission to read the Bible, and even commands to consult it, go back to the Qur’an and the sunnah (life example) of the messenger of Islam. By actually reading the Bible, al-Biqa-i found much that attracted him. For example, after quoting a long passage from the book of Jeremiah in his commentary on the Qur’an, al-Biqa-i described the passage as “a speech that is sublime in its style, exquisite in tis tenderness, such that it crushes the livers, rends the hearts, and makes the eyes swell with tears.” Such joys are lost to those who refuse to read the Bible, or who choose to obey a prohibition against reading the Bible out of fear. Therefore, this book is an invitation to read and reason together. This book is offered as a gentle answer to a Muslim book, which has done a great deal of damage to reading and reasoning between Muslims and non-Muslims, the Izhar al-haqq. Rahmat Allah Kairanwi published the book in 1864 in Arabic. The book continues to be published in Arabic (1998) and is widely distributed throughout India in the Urdu translation Ba-ibal se Qur’an tak. The Arabic title translates as “Demonstration of truth.” The following pages will show that key accusations contained in the book are in fact false. In any case, the Izhar al-haqq was not an invitation to read and reason. Rather, the Muslim book was an angry attack claiming the authentic Torah an Gospel had disappeared because Jews and Christians had falsified the original text. The intention of this answer is to invite friendly conversation between Muslims and non-Muslims. The accusations of the Izahr al-haqq must be answered. Not to answer might mean to some that the accusations of the Izher al-haqq are correct; or that non-Muslims do not know how to answer, that they have no answer, or that they do not care enough to take the time to answer. But false accusations must be answered. Many Muslims demand an answer—either sincerely wanting to know the non-Muslim response, or rhetorically as an attack, wanting non-Muslims to say the accusations are true. It is interesting to see how Shabir reacts to Andy’s recommendation of the book. Shabir is usually calm, courteous and forthright in his presentations, considered to be a real gentleman by the Christian apologists that he has debated. However, on this occasion he is noticeably upset with Andy for highlighting and promoting the book, and publicly challenges Gordon Nickel to a debate, telling Andy that unless he wants to produce Dr. Nickel on the spot, that he should not mention the book again. Although Shabir may have a number of reasons for reacting in such a way, my personal take is that Dr. Nickel’s book is, as Andy put it, the “definitive answer” to the accusations of falsification/corruption found in the Izher al-haqq, accusations that have negatively impacted the Muslim community since its publication. 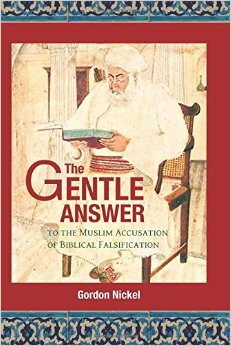 But more importantly, The Gentle Answer is a masterful expose and truth bearer, presented in a “gentle” format, that when read with an open heart, will help to set our Muslim brothers and sisters free and enable them to read the Torah and the Gospels with eyes that are free from the falsehoods of the Izher. Let us pray that the Holy Spirit will use this book to bring many into Jesus’ glorious Kingdom. Dr. Gordon Nickel is adjunct professor of Islamic Studies at the University of Calgary, Alberta, Canada. He began his study of Islam at the School of Oriental and African Studies, London (M. A. 1987), and wrote his PhD dissertation under Dr. Andrew Rippin at the University of Calgary (2004). Gordon also has an M.A. in Hebrew bible and has completed several years of doctoral research in Indian Islam at Osmania University in Hyderabad, India. In 2011 Brill Academic Publishers published his monograph Narratives of Tampering in the Earliest Commentaries on the Qur’an. Gordon has taught on Islam and the Qur’an at Associated Canadian Theological Schools, the University of British Columbia, Trinity Evangelical Divinity School, and the University of Calgary. Dr. Andy Bannister is the Director and Lead Apologist for Ravi Zacharias International Ministries (RZIM) Canada. He speaks and teaches regularly throughout Canada, the US, Europe, and the wider world. From churches to universities, business forums to TV and radio, Andy regularly addresses both Christian audiences and those of all faiths and none on issues relating to faith, culture, politics, and society. Dr. Shabir Ally is the president of the Islamic Information & Dawah Centre International in Toronto, Canada. He is a Muslim academic and public speaker on Islam and comparative religion. He is also a prolific debater engaging in regular debates around the world with noted theologians, Christian apologists and renowned philosophers. Dr. Shabir Ally holds an M.A. and PhD in Islamic studies from the University of Toronto. He completed his B.A. in Religious Studies from Laurentian University in Sudbury, Ontario, with a specialization in Biblical Literature. He also possesses a B.Sc with a major in Physics. In 2013, he completed his Ph.D and obtained his doctorate with his thesis being on Qur’anic exegesis. For over 30 years, he has been an active member of the Muslim community in Toronto, as well as an active participant in interfaith dialogues, debates and initiatives. He is a prolific debater and is viewed as a leading Muslim debater in the world on religion and Christianity. He is an internationally sought after speaker, scholar and theologian, and is the author of numerous books on Islam and Christianity. He is also the founder and resident scholar of Let the Quran Speak, a show that promotes the understanding and appreciation of Islam and Muslims globally and is broadcast weekly on Canadian national television.